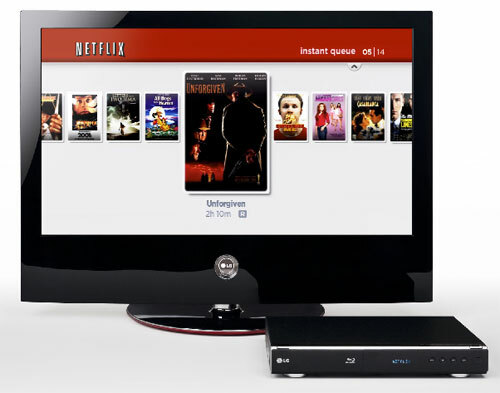 LG BD300 is First Blu-ray Player to Stream Netflix Content | OhGizmo! By Shane McGlaun on 07/31/08 • Leave a comment! I am a big fan of movies; especially HD movies form my PS3 Blu-ray drive. I was glad when Blu-ray won out over HD DVD, not so much because I liked Blu-ray better, I was simply glad to see one format win despite the fact that I am now stuck with a worthless HD DVD player. Now that Blu-ray is the standard, we are starting to see players with some cool features show up. LG announced an interesting player called the LG BD300 Network Blu-ray Disc Player. The BD300 does everything you expect a Blu-ray player to do like play full 1080p resolution Blu-ray movies, upscale standard DVDs to 1080p, and it supports BD Live. LG also adds its LG SimpLink technology for easier control of compatible LG devices. The coolest feature of the BD300 is that it is the first Blu-ray player that can stream Netflix films over the Internet to your HDTV. Netflix subscribers can stream over 12,000 TV shows and movies from the Netflix Instant Queue library. Pricing and shipping information for the BD300 is unknown at this time.